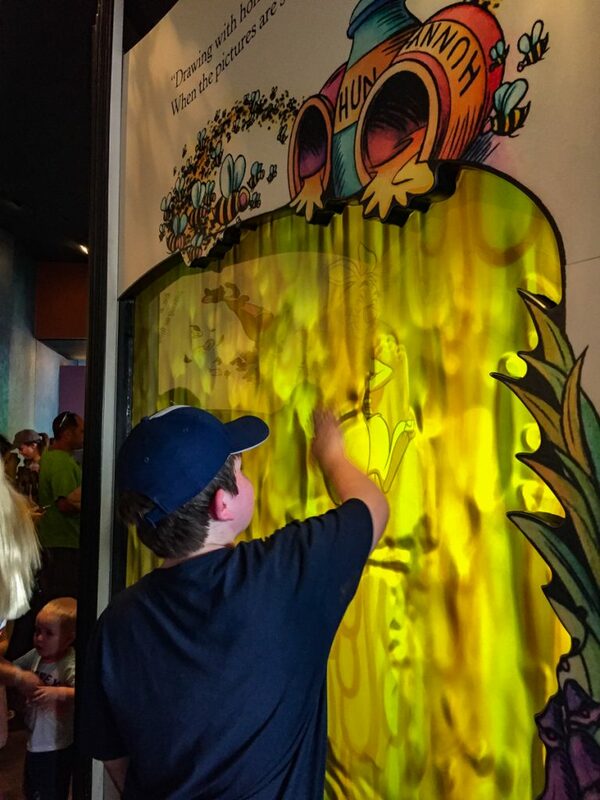 If you are searching for fun things to do at Walt Disney World with a five year old, then you’ve come to the right place. Let me preface this by saying that you won’t find much Princess talk here in this post. I have a boy, so we skip over all the Bippity Boppityness and head for the shoot-em-up rides. Your daughter might feel the same way, who knows. If so, that’s awesome! Also understand that every family is different and has different needs. I have a bad hip and as my blog name implies I am unskinny (aka overweight) so I go at a much slower pace compared to most. I also have to consider whether I will fit comfortably on some of the rides. Your Disney experience will likely be a lot different than mine, so you might disagree with my advice. But, that’s what is so great about Disney- there is something for everyone! For all you out of shape parents of boys and tomboys or anyone with an aversion to pink in general, this one is for you. 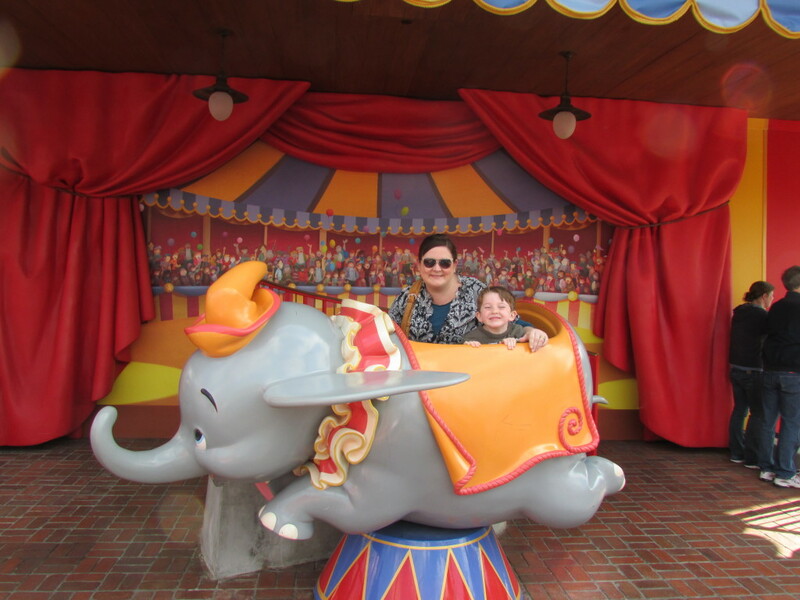 We spent four days at Walt Disney World in February with my parents to celebrate Garrett’s fifth birthday. Instead of throwing a big party for 20 preschoolers this year, we decided to plan a trip to Disney World instead. This was our third time to visit Disney with Garrett, but it was the first trip where we’ve taken him to all four parks. I’ve always avoided Epcot (or as he called it, Apricot) with him up until this point, because there is just not much to appeal to the toddler crowd there. I’m glad we took him this year, because he really did enjoy it. We were there the week of President’s Day, when Kelly Ripa was filming the morning show at Magic Kingdom, and the crowds were at their absolute peak. Let me say that over the years I’ve visited WDW in July, May, October and now February and this was one of the most crowded weeks that I’ve ever seen at the parks. Wait times averaged 90 minutes or longer and Fast Passes that were handed out at mid-day weren’t returning until after 7 or 8 pm at night. It was crazy crowded! On the plus side, the weather was perfect. It started out cold but quickly warmed up to the 60’s. Perfection. 1. When you arrive, head straight up Main Street USA and take that iconic picture with the castle in the background first thing, because you might not get the opportunity for a smile at the end of the day. Do it now and get it out of the way before the meltdowns begin. 2. Turn right into Tomorrowland. 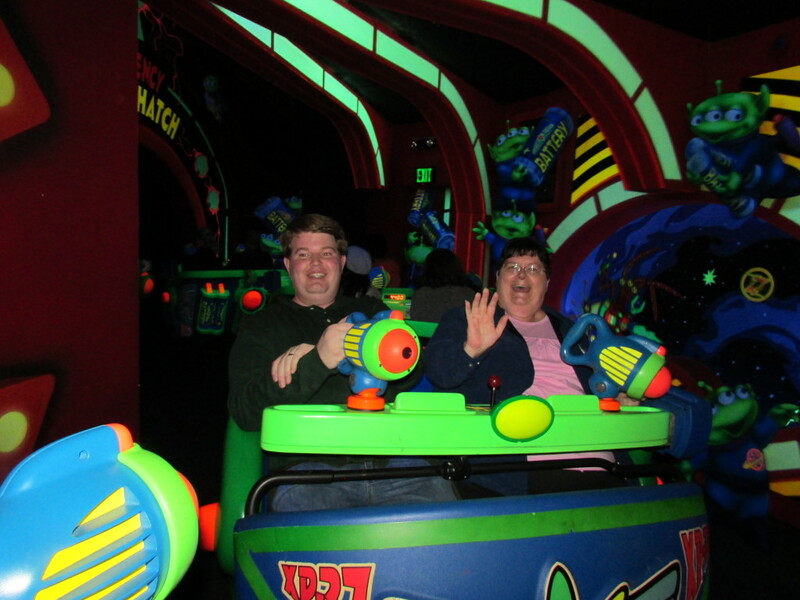 The Buzz Lightyear Space Ranger Spin is one of our favorites and one of the first we like to do. It’s a neon, glow-in-the-dark trip through outer space where you shoot at the evil Emperor Zurg and a bunch of aliens. Garrett loves for me to spin the ship in circles in circles while he shoots. Be sure to smile at the end- they are taking your photo. 3. The Monsters, Inc Laugh Floor is right next door which is convenient even though it’s not really a must-see for us. It’s good for some chuckles and it’s a nice cool place to sit down and rest for a minute. Garrett did laugh a few times, but I wouldn’t say it was his favorite thing to do. If you have a kid with a short attention span you might skip this and head for more action. 4. The Astro Orbiter is another fun carnival type ride in Tomorrowland. You ride an elevator up to the platform and hop into a rocket ship that circles high above the park similar to Dumbo. The difference is that it’s kind of like sitting inside of an Olympic bobsled or a kayak, so you have to hoist yourself up and out of it when the ride ends. If you have any trouble getting up off the ground unassisted you might have issues with this one. The People Mover never has a long line but it’s fun because it takes you behind the scenes of Space Mountain and The Buzz Lightyear ride. It’s a nice, easy ride to do with toddlers but it’s kind of boring if you don’t want to waste your time. From Tomorrowland we head over to Fantasyland. There is a lot more to do in Tomorrowland, but those are our favorites. The Tomorrowland Speedway looks fun, but it’s easy to find a go-cart ride back home so we skip it. 5. The first things you see when you arrive in Fantasyland are the TEACUPS! They are probably one of our most favorite rides just because they are such a classic, and we both love spinning around in circles. My husband sits this one out because he can’t handle spinny rides. 6. From there it’s easy to head over to Dumbo, which is arguably the most recognized ride in the world. Gotta ride Dumbo. They’ve moved the original ride and added a second duplicate Dumbo beside it so the lines move faster. They have also added an indoor circus/ playground area for those waiting in line. Great distraction for the kids. 7. Pete’s Silly Sideshow is a great place to hit up four characters in one place. Goofy, Donald, Minnie and Daisy were there when we went through. 8. If it’s hot outside the Casey Jr. Splash N Soak Station would be perfect place to cool off and get wet. It was about 40 degrees the day we were there, so that was a no-go. 9. Head back out toward the castle and ride The Many Adventures of Winnie the Pooh. It’s a super easy, non-scary and calm ride and there’s also lots of fun things to keep kids busy while they wait in line. 10. Continue around Fantasyland toward the carousel. Gotta ride the carousel! 11. Mickey’s Philharmagic is basically a 3D cartoon on a big movie screen. We saw it when he was two years old, though, and he enjoyed it then. We skipped it this time because Garrett was traumatized by “It’s Tough To Be A Bug” 3D experience in Animal Kingdom and now has a permanent aversion to 3D glasses. 12. Peter Pan’s Flight is one of Garrett’s favorite rides. He loves the Tick Tock Croc snapping up Captain Hook at the end. 13. After two trips to Disney my husband refuses to ride “It’s a Small World” again, but it’s a fun, easy little ride that is another must-see classic if you’ve never done it before. If you have done it before, feel free to skip it and save your sanity from that ear-worm. 14. Under the Sea: Journey of the Little Mermaid is a fun and easy ride that takes you “underwater” and plays all the best songs from the Little Mermaid. Definitely a fun ride for the littles who love oceans and Little Mermaid! Believe it or not, this is everything that we had time to see at Magic Kingdom in one day. The lines are just too long to do any more in a single day. We spent a full day at this park and left at about 5 pm when Garrett was too tired to go much further. You might want to stick around for the fireworks or save them for Day 2. Day 2: Here is the best tip I can give you for seeing Magic Kingdom on different days of your trip– If you see only one half of the park one day and decide to go back another day, skip the crowds on Main Street and ride the railroad train around to where ever you left off on the last trip. The train circles the park continuously and stops in Frontierland, Fantasyland and at the Main Gate, so you can hop on at the Main Gate and ride back to Frontierland or Fantasyland, then work your way around to the other parts of the park that you missed. Plus you get a fun train ride out of it instead of getting rammed in the Achilles heel by giant plastic strollers on Main Street. The Magic Carpets of Alladin is really fun- just like Dumbo but the camel spits water at you so there’s a chance you’ll get a little wet. Swiss Family Treehouse is fun to explore, just be prepared to walk up a bunch of stairs. If you have bad knees you might wanna sit this one out. Jungle Cruise: This one is pretty cheesy, but if you want to give your kids the memories that you had at Disney as a kid you might do this one for the nostalgia factor. We don’t waste time here because the Safari ride at Animal Kingdom is so much better. Tom Sawyer Island: You ride a little pontoon boat across to the island where there are cool caves to explore and a wobbly barrel bridge to walk across. It’s a good place to have a picnic since it’s shady and never very crowded. Pirates of the Caribbean: This is another one of those old rides that has been at Disney since forever but it’s still a big hit. There is a little stomach-lurching drop in the dark but it’s nothing too scary, just be aware if your kid is scared of “roller coasters”. Pirates Adventure- Treasures of the Seven Seas: if you have a Pirate-lover this is a fun little way to keep them entertained by going on a quest to collect Treasure finder cards. I would only do this if you have an unlimited amount of time at Disney, though. Haunted Mansion- The scariest part of this is the build-up of anticipation while standing in line to see “ghosts”. It’s not scary at all. Very much a Casper the Friendly ghost kind of vibe. I wouldn’t put it at the top of my to-do list, though. AK is one of our most favorite parks for Garrett. He loves nature and being outside, so just the jungle-like feel of the park itself is fun to walk through and explore. There are lots of zoo type attractions with birds, animals and plants that you can stroll around look at without battling too many crowds. 1. The best advice I’ve ever gotten about AK is to head straight back Africa upon arrival and get a Fast Pass for the Kilimanjaro Safari ride. The animals move around more in the morning, so the earlier you do this ride, the better. The trouble with doing this is it totally throws off seeing the areas in order and you wind up walking a LOT more to back track and see other areas. But, it’s still good solid advice if you don’t mind the exercise. The safari ride is a must do for us at Disney. The last time we rode it we had two Rhinos get into a shoving match and one bumped right into the side of our bus. I’ve never seen a bus driver throw off a headset and get on a radio so fast. We didn’t move, just sat there watching these two giant Rhinos square off at each other and get shoved around. It was AWESOME. 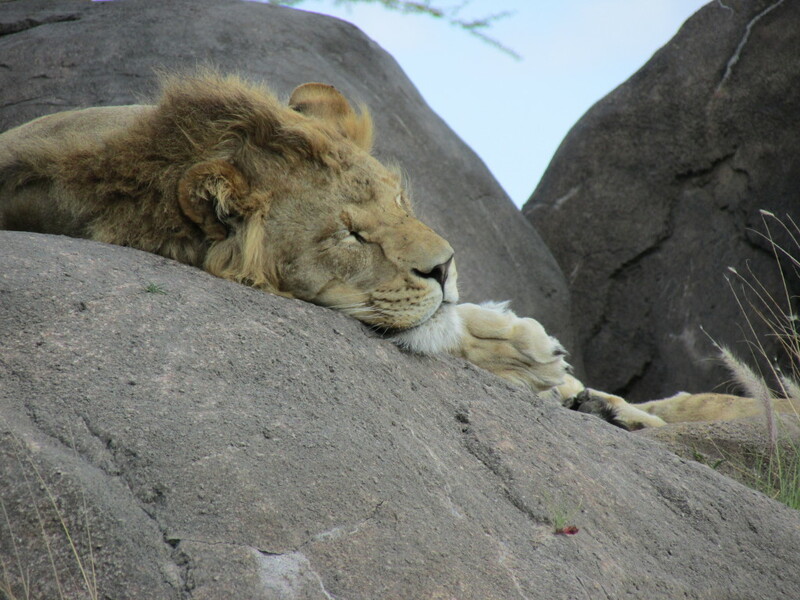 You never know what you’re gonna get on that safari, but you can almost always count on a sleeping lion! 2. Festival of the Lion King in Camp Minnie-Mickey is an excellent show, and Garrett even got picked to circle the stage and dance during one part of it. Then, Timon called him out from the stage and said “Great job! Especially YOU.” and pointed at G and blew him a kiss. It was so great, and you can watch the video of him dancing at Festival of the Lion King here. 3. In the back of Camp Minnie Mickey there are more good opportunities to hit a bunch of character photo opps all at once. Mickey, Minnie, Goofy and Donald take pictures back here in their safari outfits. 4. There are Kid’s Discovery Club stations at every land where the kids have to complete a quick activity and get their passport stamped. G enjoyed all of them, and filling his card became a priority. 5. It’s Tough to Be a Bug is a 3D, interactive movie underneath the Tree of Life on Discovery Island. Garrett has inherited my fear of bees and buzzing things, so I should have known this was probably not a good idea from the beginning. The movie was cute, but then, when giant scary spiders dropped down out of the ceiling along with a blast of steam he nearly had a come-apart. He tried to squeeze himself between the seat and my back and started yelling for me to get him out of there. Needless to say, we won’t be doing that one again when he’s little. Let the lifetime of arachnophobia begin…. Beware! If your kids can’t handle scary stuff at all, avoid at all costs. 6. Back in Africa, there are lots of things for the kids to do. 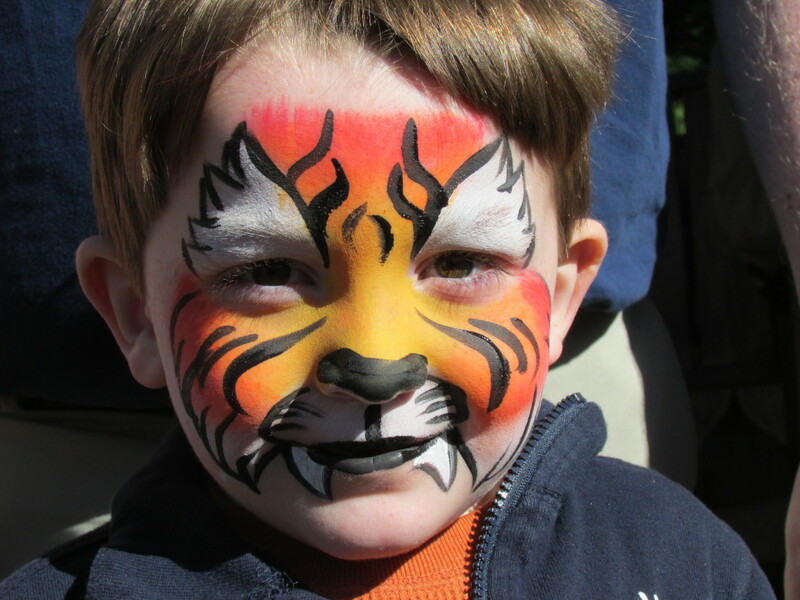 Garrett loves getting his face painted, so we usually do this at AK. On this trip he got a Pluto face at AK and a tiger face at Epcot. 7. Rafiki’s Planet Watch is a favorite place of Garrett’s so we ride the train out there. When you arrive you walk through the woods for a bit to a building and a huge petting zoo area. The pigs, goats and sheep are able to run loose along with the kids, so prepare for that if you or your kid are on farm animal germ alert. There is a bucket of bristle brushes by the entrance, so grab one of those and let the kids brush the animals and watch them play on a big shaded rope bridge area. We got to watch a little program featuring a skunk and a porcupine and learn all about their defenses in the wild. G loved feeling the porcupine quill at the end. 8. We typically skip Asia and head to Dinoland for the rest of the day at AK. There is a huge carnival game area called Fossil Fun Games where you can purchase tickets to play the games and win prizes. Like everything at Disney, it’s not cheap (especially on top of the ticket you’ve already paid for to get into the park) but it sure FUN. And unlike most rigged Carnival games, you actually win good prizes. We spent a long time in here playing the carnival games with my parents and laughing whenever Garrett would win because he would get SO excited. He racked up on stuffed animals and prizes. 9. Finding Nemo, the Musical was a beautiful theater production that kept the kids and adults both entertained. Well, except for my dad who slept through the entire thing. But the rest of us loved it. It’s a play that’s acted out with real people using character puppets from Nemo. It’s hard to explain, but I was very impressed by it. It was just beautiful, and so creative the way they retold the story of Nemo in a 30 minute stage show. 10. The Boneyard is a tricky one. The kids LOVE it. The parents? Not so much. Unless you are a totally free-range parent who has never had any paranoid delusions about your child being kidnapped in a crowd, this place is bound to cause you some anxiety. It’s essentially a giant playground, but the chances of losing sight of your kid inside this place are pretty much 100%. The slides start at one part of the playground and come out in a totally different area. They can climb inside treehouse like mazes and not come out for 5-10 minutes. It’s pretty much a helicopter parent’s worse nightmare. Be prepared, and avoid at all costs if you’re one of those parents who cannot handle losing sight of your child in a crowded place. The bad thing is, there is a really cool dino-dig at the back of this place where Garrett could spend hours digging for bones, but you have to get through the giant maze of playground temptation to get there. 11. Triceratop spin is just like Dumbo, but with dinosaurs. Great break down, we went to Disney World on our Honeymoon … LOVE this place! Now I have to go to Disney! You have great ideas and advice! 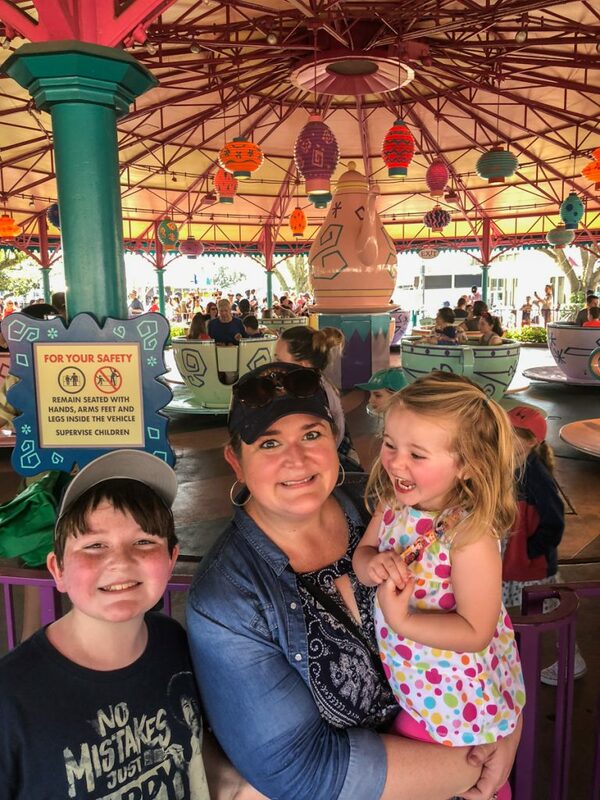 I can’t wait to take the kiddos back to Disney…definitely won’t go in June again! Looks like you all had a blast…thanks so much for the awesome tips!!! Fabulous tips!! Especially…”it’s supposed to be fun!” Wiser words were never said! 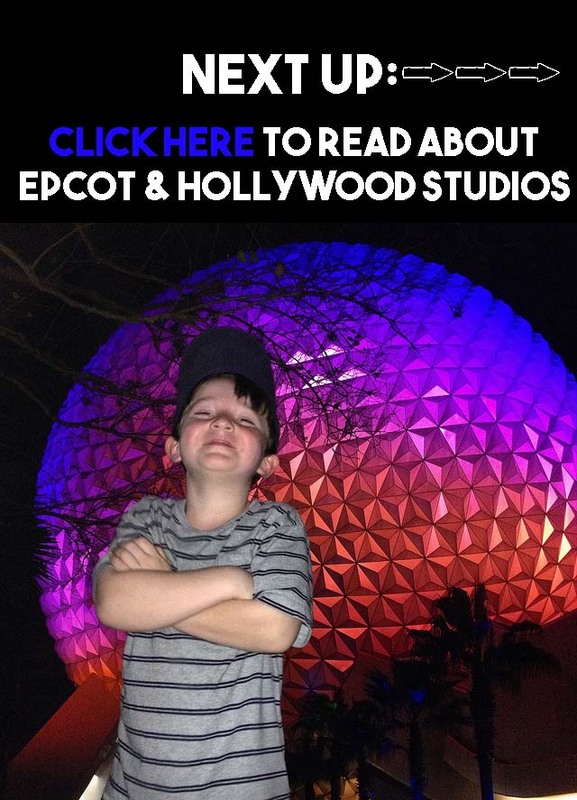 1 – love your Duck Dynasty reference 2 – from a Central FL resident, those are GREAT tips for Disney World with a little guy!! Looks like you had such a great time! The princesses and Mickey currently meet in the theater on Main Street. We discovered that the best time to visit is during or right after the parade. We stake out a spot in front of the theater to watch, then turn around and head inside to meet our favorite characters while everyone else is still tangled up in the parade mess. If you reach the high score of 999,999 on Buzz Lightyear Space Ranger Spin, you can claim a badge in the gift shop that declares you to be a galactic hero. My little person loves roller coasters. (Yay! Someone to ride with!) but he was just a smidge short for Expedition Everest and Space Mountain. The awesome cast members gave him a special pass to bring back on our next visit when he’s tall enough that will allow us to use the Fast Pass line. It helped ease the sting a bit. Test Track, Soarin, Maelstrom, and the ride in Mexico were all on Adam’s must-see list. We’re going to WDW in May for a fun vacation (just JM and I), but reading this list, a lot of this stuff sounds like things JM would love! He’s still a 5 year old kid at heart I guess. 🙂 Thanks for all the tips! Wow! You are an EXPERT! I so so so loved Disney last time we went. We hope to go back soon and since Kennedy is 7 now, she’s really not into the whole princess thing any more either. Your advice is still great for us! Also, hate to tell you, but the reason it’s so busy there in February is because of us dang Canadians. About half of my town leaves and goes to Florida for most of February. No joke! I’m dying to take the boys to Orlando! But our first stop would be Lego land! I think you and I are related! 🙂 I am also unskinny, my son calls Epcot “Apricot,” and he got lost in the Boneyard. I’m not a helicopter parent, but I didn’t realize there’s only one exit, so I was just about in panic mode after 15 minutes of not seeing him. He was happily digging away finding dinosaur bones. We’re going back next month for a surprise trip and I can’t wait! Love Disney World! FYI – It’s bibbidi bobbidi 🙂 We have all girls. We love The Pirates League and don’t forget to go to Harmony Barber Shop! Cheap and great for ALL ages!! My son was terrified of “It’s Tough to Be a Bug” also! We went to Disneyland in California for our Spring Break this year and we ended up having to leave the show early because it scared him so much! I’m glad we weren’t the only ones to have problems with this show. Thank you so much for posting this!! We are taking our son in Feb 2014 for his 5th b-day 🙂 It will be our first trip there. I appreciate all your pointers and suggestions! Especially the warning about the Bug one! I do not like spiders but I think our son may enjoy this so I don’t want him to miss out because of my fears. And when I say I don’t like them I actually have an irrational fear of them–mom may be setting this one out lol! Thank you again!! I’m going to Disney World with my family this May for the first time and was feeling so overwhelmed. Your post helped me plan SO much!! Thank you:) I’m following your advice!! I’m in the early stages of trip planning (looking at Oct ’14), but I’m already obsessing about things. This post was awesome, I have been a little more focused on our little Princes because there’s so much more information out about girls. I’m excited to have an idea of where to send my little pirate and his dad while my daughter and I have some girl time. Thank you! Lots of great advice! We plan to take our son for his fifth birthday ( he is eight months now and it will take us that long to save up for it anyway..). Its nice to hear what rides little boys would like and not all that princess stuff. Thank you so much for this. I have looked online and we are taking my son Gunnar and he will be 5 years old and I had no idea what to do and what to stay away from. This is perfect. 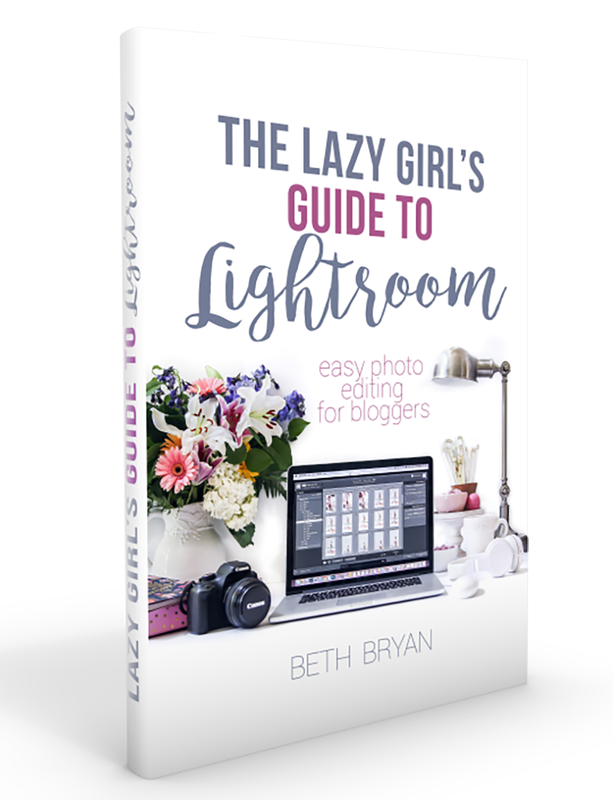 Thanks so much for this blog! We’re going on our first trip to Disney in September. This is a tremendous help for someone like me~a mother of 4 1/2 year old twins, and the wife of a wonderful man who happens to have a neurologic pain condition. This list gives me great ideas for how to use our time wisely, so we can ALL enjoy ourselves. Thanks for your post. Great info. I’m taking my 5 year old grand daughter tomorrow. this coincidence didn’t happened earlier! I bookmarked it. Omg this was an awesome post! So helpful for planning our trip this coming Feb. Especially the part about the parks where your kid disappears! Hilarious and frightening. Thank you!! Here is another good tip– (honestly I can’t remember if I included in my original post.) On your first day at MK, focus on the rides on the right half of the park in Tomorrowland and Fantasyland. Then, if/when you go back to the Magic Kingdom for a 2nd day, hop on the train right at the front entrance and ride it around to Frontierland Station, then work your way back to the entrance! That way you only have to focus on 1/2 of the park each day. It’s a great way to break things up. Wow!!! This is great. Just what I was looking for!!! Thanks for so many great tips! I am a plus size gal (more like plus-plus) and know that the rides are not built for larger people. Will my 17 year-old be allowed to ride with my 5 year old even though she isn’t yet considered an adult? Just wondering if you knew about this. Also, I have fair skin and can burn in under 30 minutes, am I allowed to bring a small umbrella into the park for my own personal shade? Thanks! You can bring a compact umbrella, yes! HAVE FUN!! I’m planning a Disney World Trip for my son’s upcoming 5-year-old birthday. This piece is very helpful! Thank you for all the great tips!